Are you getting excited? Christmas is in the air! It's December and it's time to get ready for all those Christmas festivities ahead. Let's kick off the holiday season with these fun dangle earrings that will take you on a magical balloon flight with candy canes in tow! 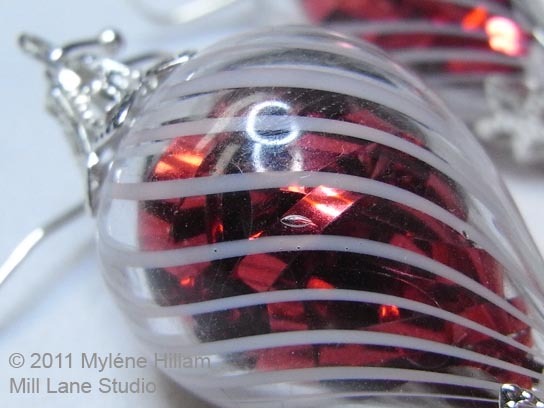 This project would look really cute with a Santa charm dangling from the balloon too but the white swirl in the hollow glass beads reminded me of a candy cane so that's what I've used. To begin this pair of earrings you will need a needle too or other sharp object to feed the tinsel shreds inside the hollow beads. It will take a bit of patience to feed the lengths in but it's worth the effort because the bead looks rather spectacular when it's stuffed full! 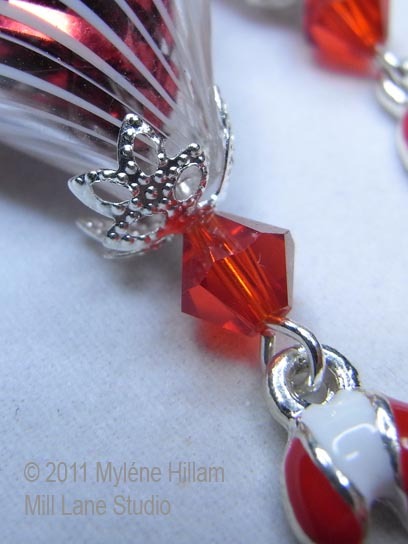 On the eye pin, thread a crystal , the adjustable bead cap and then thread the eye pin through the tinsel-filled bead. Take care not to push the tinsel out the other end! Gently cup the adjustable bead cap around the narrow end of the hollow bead. Then add the petal shaped bead cap, followed by the filigree basket bead cap and turn a loop. 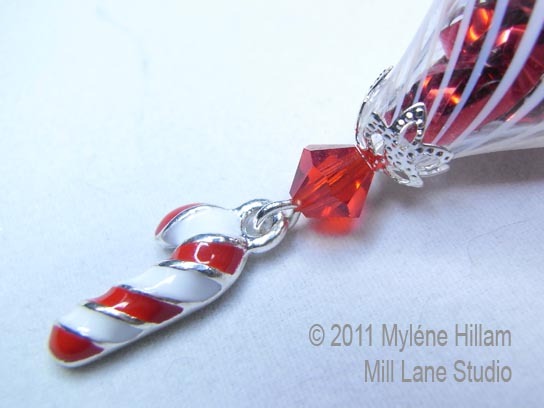 Open the bottom end of the eye pin and hook on the candy cane charm and then close it securely. To finish the earring, I've used an interchangeable earring hook. I've taken a real liking to these lately because there is no loop to open or close. 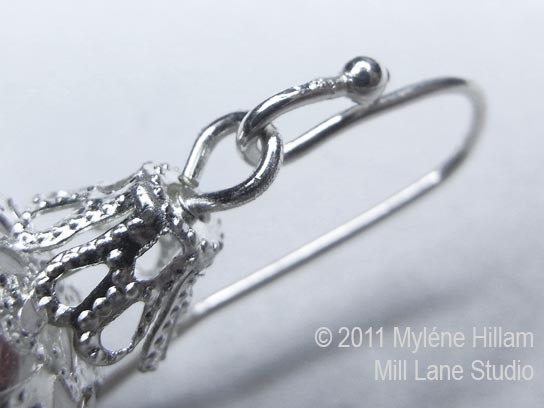 Just hook the eye pin on the wire and gently squeeze it closed. 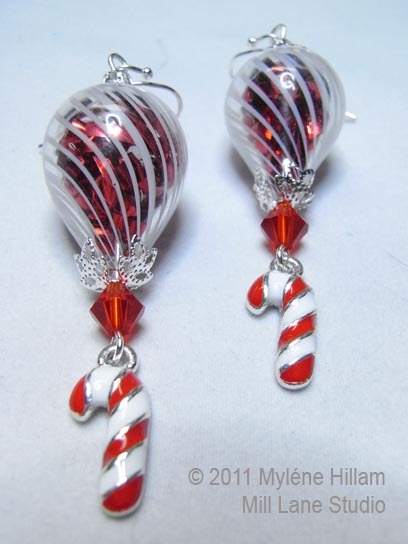 Make the matching Peppermint Twist earring and you're ready to wear your whimsical and calorie free candy cane earrings to your next Christmas function! 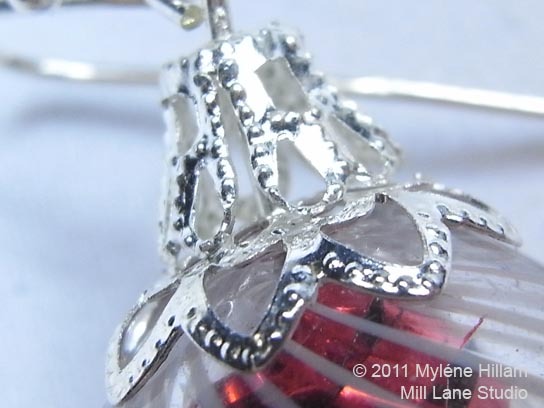 If you like these earrings, look out for my 12 Days of Christmas earrings ebooks. Each volume is filled with 12 unique designs and can be downloaded right after checkout. They are fun, aren't they! And quite light because the bead is filled with just a couple of lengths of tinsel shred.